Technical and scientific aspects of water-from-air machine (atmospheric water generator) operation are introduced and explained for prospective buyers, owners, and users of this equipment. 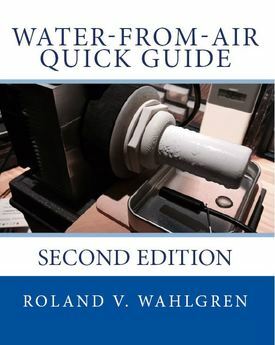 The knowledge in this guide is valuable for making cost-effective decisions about using the freshwater resource the exists in Earth's atmosphere. Updated July 2018 (including minor corrections). ​Now available as a Kindle e-book!—at any Amazon site, search the Kindle Store using the term "Roland Wahlgren".